My friend and fellow pop culture blogger, Malcolm, pointed out in a comment on my last post that there is no right or wrong when it comes to popular culture and he is right! When I said that I believe pop culture is achieved over time I was injecting my own personal preferences for the pop culture of my past over today's pop culture. I was making a judgment call on something that really can't be judged! This is a disease of old farts! You know, old fuddy-duddies who can't stand "them new fangled things". Crap, I'm an old fart! How did that happen? How did I turn into the old lady who frowns at young people and mumbles things like "we would never have done that in my day!" while swinging my cane and hunting for my dentures? My only excuse is that, as an old fart, I was having a bad day from missing my nap and had a senior moment! So, to all you young people out there I apologize - you have every right to create your own pop culture and the next time I regress into a grumpy old bugger you have my permission to beat me over the head with my own cane! Now, go over and visit Malcolm's Blog - Pop Culture Dish for some fresh air and some great pop culture - past and present! I'll take a chill pill and get a nap and come back with a better attitude! Definition of popular culture from Dictionary.com: Contemporary lifestyle and items that are well known and generally accepted, cultural patterns that are widespread within a population; also called pop culture. JUST BECAUSE IT'S POP DOESN'T MEAN IT'S CULTURE! When I started this blog my whole purpose was to revisit my past and remember some of the great things from American Culture that became iconic and achieved stature as Pop Culture. In my humble opinion, Pop Culture status is achieved over time and not just passing fancy. Now, when I search for "pop culture" on the internet many links pop up to a blog or a site with current fads and phases and people of the moment. This is not my concept of Pop Culture. Just because it's a fad or popular now doesn't mean it has achieved pop culture status. This is truly only achieved and recognized over time. So Mylie Cyrus aka Hannah Montana is not a pop culture icon, she is simply a pop idol of the moment. Only time will tell if she will achieve the level of "pop culture" such as past pop idols like Madonna or Cher. So I will continue to compare the pop culture of yesterday to what is hailed as pop culture in today's world and let the future decide what is and isn't true pop culture. The interesting part for me how things morph and then morph again, sometimes to come right back full circle! I was wondering what ever happened to Roller Derby? Do you remember Roller Derby matches on television in the 50s? I used to love watching them. My favorite parts were the body checks that ended in a skater being tossed over the railings - I was a bloody minded little kid, lol! In the seventies they made a movie called "Rollerball" based on the sport. It starred James Caan (JONATHAN! JOHNATHAN!) and it was a futuristic view of the socio-economics of professional sports, in this case Roller Derby. The ending was great, the Machiavellian minds of the sports promoters and team owners punctuated by the organ playing Toccata and Fugue in D minor by J. S. Bach. I don't remember seeing a lot of men in Roller Derby when I was a kid in the fifties. Most of the shows I remember seeing featured women. But the staged violence was reminiscent of the wrestling matches that I remember in the sixties and which are still being televised today. I wonder why the wrestling matches made it through to today and not Roller Derby? To me Roller Derby was the more interesting of the two "sports". My Aunt Agnes was a knitting fiend! I was always getting something knitted from her when I was a kid. Usually something goofy or embarrassingly wearable, little dolls with knitted or crocheted dresses and often these weird socks or knitted booties. Though I loved getting presents as a kid, I wasn't all that fond of Aunt Aggie's presents. I got one every birthday and at Christmas every year until she passed away. She was still sending me those dolls and socks when I was a teenager. It's kind of sad when you get older and realize what a little snot you were when you were a kid. As I grew older I thought those presents were silly - for little kids - but my mom would force me to write thank you notes for them anyway. I really hated writing those letters thanking someone for something I didn't like. I was too young to realize that it wasn't the present that mattered, it was the fact that I had an Aunt who loved me enough to send me something she had spent her time making. Unfortunately, my Aunt Aggie passed away when I was still too young and self-involved to make amends. Recently, many, many decades later I was reminded of those dolls and those silly booties when a friend showed me a pair of knitted booties she had just gotten from a friend. It took me back in time to the days when I would open a package and find a similar knitting project in my gift box from an aunt who cared about me enough to send the gift. Thank you so much for all the wonderful gifts that you knitted and sent me over the years. Now that I am older I know that they were created with love and sent to make me happy. I just want you to know that the memory of all those gifts has brought me a very poignant moment of true happiness that you loved me enough to send something you had made personally. You never missed a birthday or a holiday, not once in all those years. What ever happened to Doll Cakes? I was watching Ace of Cakes the other day and they made a cake that reminded me of those doll cakes that were so populart in the fifites. Do you remember those cakes? They were cakes where a real naked doll was placed in the middle of a cake baked to look like a skirt and when you frosted the skirt you frosted up the bodice of the dress on the doll. Little girls in the fifties thought these were the height of birthday chic. I was not one of those little girls, I thought they were too girly and stupid, fortunately my mother never made the mistake of making one of them for me. I got chocolate cake and vanilla ice cream - still one of my favorite birthday desserts. Anyway, I was just wondering what happened to those cakes so I googled "doll cakes" and I discovered the Doll Cake is alive and well and still sweet and sugary. Okay, I guess they're perfect for little girls who are sugar and spice and everything nice - I just was more of a snips and snails and lizard tails kinda girl. FLIP FLOPS AREN'T CALLED THONGS ANYMORE? 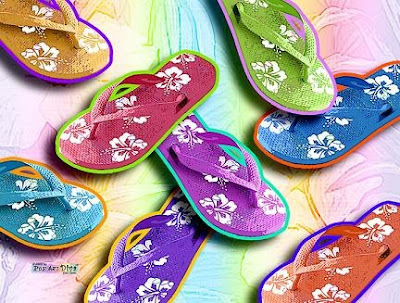 When I was a kid flip flops were called thongs. You heard me right. You know those little rubber sandals with just a flat sole and a strap that slid between your toes? Thongs! Telling people I tripped on my thong has brought on some very strange looks. And I often trip on thongs because they slide off my feet if I'm not careful! I have caused myself untold embarrassment from tripping on thongs and because I cannot overcome my childhood habit of calling them thongs! You see, in those days what people call thongs now were called g-strings! Don't ask me why, they just were! I'm sure there's some truly obscure yet fascinating origin for the words thong and g-string but I don't plan on doing intensive research on the subject. After all, we're talking rubber sandals here. I do have quite a collection of thongs - ooops, flip flops - these days. Seems they have become all the rage as a fashion accessory. I have fuzzy thongs - darn it, flip flops! - and cute metallic hot pink ones and a pair that looks like they were wrapped in colorful rags. They're comfortable and cool in the heat and easy to get on and off. In fact one of my favorite things to do with thongs - oh man, flip-flops! - when I was a kid was to see how high and far I could kick them off my feet! If only I could kick the habit of calling them thongs! FLIP FLOPS AREN'T THONGS? is available as archival prints and giclees on canvas in various sizes at PopArtDiva.com. Copyright 2008 by PopArtDiva.com. All rights reserved. No permission is given to copy, distribute or reproduce without written permission from PopArtDiva.com. THE MARTIANS ARE COMING! THE MARTIANS ARE COMING! The show centered the beginning of the "invasion" around New Jersey with a "news bulletin" announcing a "huge, flaming object" had crashed on a farm outside Grovers Mills. This was followed by a number of other "bulletins" further describing the horror of aliens "wriggling out of the shadow like a gray snake" with black gleaming serpent eyes and a mouth that was "V-shaped with saliva dripping from its rimless lips that seem to quiver and pulsate". Whatever his purpose, the broadcast was the vehicle that launched Orson Wells to fame and it has become one of the most famous radio broadcasts in history, possibly second only to the "day that will live in infamy" - FDR's speech on the attack on Pearl Harbor. How times and minds have changed in the last 70 years. In today's world we are treated to kinder, gentler aliens courtesy of Steven Spielberg's "E.T. the Extraterrestrial" and "Close Encounters of the Third Kind". Much of the science fiction of earlier eras has become science fact to us. We actively look for life outside our solar system, sending images of peace and welcome to the little green men who might be our cosmic neighbors - heck, we have organizations that specialize in this exact activity like SETI. We are not the naive and gullible nation of 1938. The only way you can really scare us now is to have a mortgage crisis, see gasoline climb towards $5 a gallon and have us facing the possibility of an American President who might not be white or male. Uh, maybe we haven't come so far after all. BELOW IS THE ENTIRE BROADCAST IN SEVEN PARTS - ENJOY! 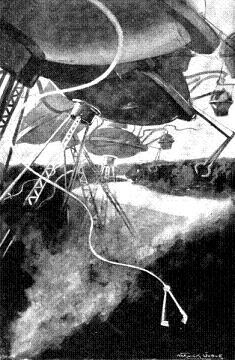 Post Image is in Public Domain from Wikipedia Commons: Illustrator, Warwick Goble for The War of the Worlds, published by Pearson's Magazine, 1897. When most people talk about "comfort food" they will mention meals like meat loaf and mashed potatoes, spaghetti and meatballs, Salisbury steak, Fried Chicken and macaroni and cheese. These were the standard fare of the family of the fifties. Dishes that were inexpensive, hearty and filled you up with calories and love. Most families did gather together at the end of the day, sit down at the dining table and share food and exchange tidbits of their day with each other. My family was no different because, though my mother worked outside the home, she still cooked dinner every night. We routinely had meatloaf but my mother served it with baked potatoes, not mashed. We had "Swiss" steak as opposed to Salisbury steak, and our spaghetti came with ground hamburger and no meatballs. We often had chili which my mother bought from the store in a brick form (no, I'm not kidding) and we got fried chicken every Sunday. We also were treated to tuna casseroles, Mom's Bohunk Goulash (kind of a hamburger-mac that utilized leftovers) and, on a few horrid occasions, liver and onions. My parents loved liver and onions and we kids were, therefore, forced to suffer through what I still consider the worst meal that can ever be served! I also dislike sauerkraut and Mom, being Czech, loved to serve that up at least once a week. I'm not even going to discuss her fondness for hominy. My mother had a few recipes that were concoctions of her own as well as the standard comfort food fare. One of these was a meal that I still make for myself to this day when I'm really feeling a need for some true comfort food. I do not know where she came up with the idea - I seriously doubt this was ever a published recipe - it's way too strange for anyone to lay claim to! You brown the hamburger so that it's a little crispy (because my Mother cooked all meats well done), drain the excess grease then add the canned spaghetti until warmed up. In the meantime you either reheat your leftover mashed potatoes or make your instant potatoes. You dish up a healthy serving of mashed potatoes and spoon the spaghetti/hamburger mixture over them. Mom served this up with a dish of sweet pickles, white bread and oleo-margerine (the kind you added yellow food coloring to!) I still have the pickles but I use a nice sourdough and real butter! That's it. No salads, we were not big salad eaters in my family. My mother was not a fancy cook, nor was she a particularly good one. She could bake like an angel though - no one made bread or Kolaches like my mother! But a gourmet chef she was not. I am a bit of a foodie and so I attempted to "gourmet" this recipe up. This was a complete disaster, it ruined the dish for comfort food and, frankly, there is no way to "gourmet" up canned spaghetti! The moral of this paragraph? Do not mess with your comfort food recipe! I call this dish "Mashed Spaghetti" for want of a better title. The funny thing about this dish is that I never would eat those canned spaghettis, even as a kid. I couldn't stand the taste or the texture of the spaghetti. Why I'll eat it this way is a mystery to me after over 50 years, but eat it I do and it always reminds me of my Mom, my family and dinnertime in the fifties in a little house in Wichita, Kansas.